Probably a unique case in European football, Braga are mostly known for their successes at international level, rather than the – very few – domestic titles they have won. Given that Benfica, Porto and Sporting leave hardly any trophies escape them in Portugal, it actually makes sense that Braga have found it easier this first part of the 21st century to shine against foreign teams, rather than in the Primeira Liga. Sporting Clube de Braga were founded in 1921 and spent the first two and a half decades wearing green, a color that didn't bring them much luck. Their now characteristic Arsenal-esque red/white jerseys were first used in 1945, a switch that seems to have two equally possible explanations. Back-then president José Antunes Guimarães was a well-known Arsenal fan, a businessman, who had to travel to London once in a while. According to some accounts, he's the one who decided that Braga should wear jerseys similar to those of the Gunners. Other accounts credit Josef Szabó, Braga's Hungarian coach back then, with the initiative. Just like the club's president, Szabó was a big fan of Arsenal, he actually tried to add aspects of the Gunners' style of play to Braga's game, and he thought wearing jerseys that would remind everyone of the big London club would actually make it easier for the players to adapt to his tactics. No matter which version is the right one, it took Braga another 20 years to win their first trophy. It was the 1966 Taça de Portugal, the club's first and only title until 2016, half a century later, when they won the same competition again. Before lifting their second trophy though, the club had already made a name for themselves at international level. It all started in the 2006-07 UEFA Cup season, when SC Braga eliminated Italian side Chievo Verona to make it to the group stage of the competition. Earning just enough points to qualify for the last 32, Braga went on to eliminate another Italian side, Parma, before losing twice to Tottenham in the round of 16. Next season they were again successful in making it through the group stage, making sure the team would still be playing international football after the winter break. Werder Bremen were the ones who terminated Braga's European season in the round of 32. Another run to the last 16 of the UEFA Cup was followed up by a historic first participation in the Champions League's group stage, thanks to huge qualifications over Celtic and Sevilla in July and August 2010. Braga even beat Arsenal 2-0 in the group stage, but couldn't finish high enough to continue in the competition. They did finish third though, so they earned the right to continue in the Europa League. Lech Poznań, Liverpool, Dynamo Kyiv, Benfica, none of them managed to stop Braga, who found themselves in Dublin's final, against another Portugal great, Porto. A 1-0 defeat deprived them of the cherry on top that the trophy would have been to an either way spectacular season. They have remained highly competitive at international level ever since, making it to the quarterfinals of the Europa League in 2016, the season they ended up winning their second Cup in Portugal. Braga's tendency to do better at international level than in national competitions is not the only thing that makes them stick out. Their stadium is another reason, a truly incredible piece of architecture and engineering. Due to natural limitations on two sides, the Estádio Municipal de Braga, also known as AXA Stadium for sponsorship reasons, can host fans only on the two main sides, without any stands behind the goalposts. Braga's one of a kind Estádio Municipal, home of the team since December 2003. 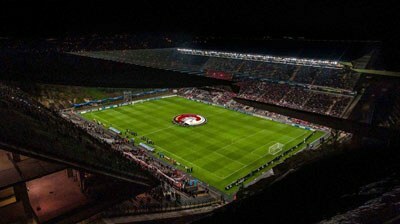 In times that many modern stadiums look very much alike, to the point of making it hard to distinguish one from another, Braga's home is one of those football stages that stay in your memory after watching just one game there. Alan Osório da Costa Silva, or simply Alan, as they use to call him at Braga, first put on their jersey in 2008, aged 29. To this day, he remains their most consistent “soldier”, having played in 337 official matches, a number that is sure to grow even bigger. Mladen Karoglan, a well-respected forward in his heydey, spent six season at Braga back in the 90s, and the 64 goals he scored in official matches (close to 100 if friendly games are included) are more than what any other former Braga player has managed. One ex-Braga player everyone knows is Tiago Mendes, who started his career there, before earning international fame playing for Chelsea, Lyon, Juventus and Atletico Madrid. An even much more famous player who has worn Braga's jersey, even for just a few games, is Diego Costa, years before turning into one of Europe's hottest strikers playing for Atletico Madrid and Chelsea. The club's logo is basically the coat of arms of Braga, the city, with the difference that blue has been substituted by red and white. Even Virgin Mary (holding baby Jesus) is dressed in red in Sporting's crest. The name of the club is written in blue, so as to make the connection to the city's shield even stronger.